Isle of Man TT Riders Association (TTRA) 1959. Homepage. 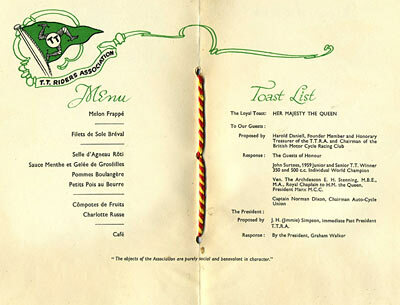 This page: A booklet from 1959 detailing that year's luncheon meeting of the TT Riders Association. TT Riders luncheon meeting in 1959. I found this menu at a local collector's centre, the only interesting motor-related thing I could find on that visit. 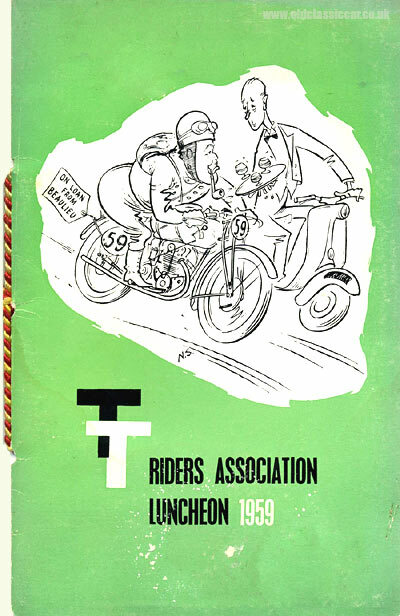 Presented by the magazine Motor Cycling, it described the TTRA members' meeting held on Monday 26th October, 1959, at the Connaught Rooms, Kingsway, London. At the time, the Patron was Lord Essendon and the President Graham Walker, winner of the 1931 Lightweight TT on a 250cc Rudge motorcycle. In 1935, after retiring from racing, Walker picked up a microphone and provided motorcycle race commentaries for the BBC, something that he continued doing after the war where, in 1949, he was joined by his son Murray. After a period as editor for Motor Cycling Magazine, Graham joined the National Motor Museum at Beaulieu, with a section devoted to historic motorcycles opening in 1956. The illustration on the cover of the luncheon menu shows a rider on a machine, "On loan from Beaulieu", being served drinks by a waiter balancing himself, and his tray, on a scooter. Presumably the rider is a caricature of G. Walker himself. The TT Riders Association was formed in 1951 and is still going strong today (link). Membership is open to anyone who ever started a TT Race on the Isle of Man. A charity from the beginning, the TTRA supports and helps riders who suffer accidents whilst competing on the TT, and also offers their families assistance when they need it most. Their fundraising efforts also help provide equipment to the Noble's Hospital on the Isle of Man, and also the Southport Spinal Unit, both of which regularly deal with motorcyclists who have run out of luck on the TT course.